Located at Portside Hamilton and named after the brightest star in the constellation of Taurus, Alcyone Hotel Residences is set to be a “shining addition to the area”, according to owners Citimark Properties. 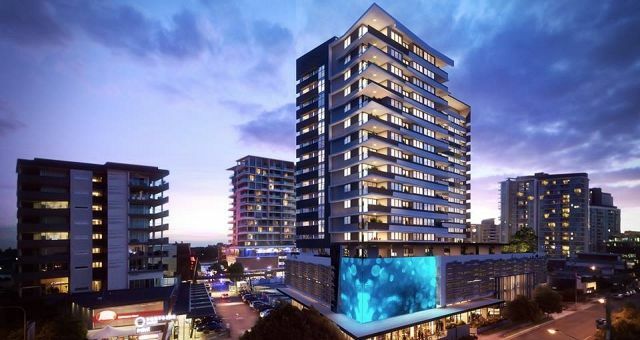 The 16-storey property’s exterior is set to light up the sky, with an LED lighting artwork, that is the largest digital art display in Australia outside of stadiums, coming to life each night at sunset. Apartment interiors also boast plenty of natural light by day, with the central feature of floor-to-ceiling tinted glass offering park, city or river views. The hotel features 105 contemporary, spacious apartments, ranging from a 60sqm one-bedroom, one-bath unit up to a 78sqm two-bedroom, two-bath. A scent by CocoLuxe Candles and fresh blooms will welcome guests, as well as relaxing music, a refreshing arrival drink and warm, friendly customer service. Australia’s largest privately-owned construction company, Hutchinson Builders, have been responsible for the construction, which is designed by innovative architecture firm, Cottee Parker. Enjoy luxurious in-room amenities with an ultra-local focus, such as Leif Australian Native bath products; and a mini-bar stocked by Newstead Craft Beer and New Farm Confectionery. Executive Rooms also include a Nespresso coffee machine; the choice of a bread maker or fresh fruit and juicer, so guests can wake up to the enticing fragrance of fresh bread or an energising juice to begin the day; as well as a plush robe and Alcyone slippers. A stay at Alcyone also includes free WiFi, a Pillow Menu, daily newspaper delivery, and complimentary secure car parking. A 24-hour room service menu is available; and guests can choose from a number of delicious breakfast options from Portside restaurants and cafes, with a charge-back service provided. Professionals on the go may access the Business Centre with all the necessary conveniences; and when it’s time to relax, borrow an Xbox, games for the kids, or choose from the book library. Alcyone will also arrange a meat or seafood BBQ package for guests to enjoy in the Podium Level barbeque area. Plus, guests can start their mornings with a reviving yoga session on the Serenity Lawn; or take a moment to look after themselves any time with the on-site pool and Fitness Centre. The 4.5-star hotel will service the booming cruise market, as well as tourists and locals searching for a getaway in this upmarket dining, shopping and lifestyle precinct located close to Brisbane’s inner-city. Angus Johnson and Robert Pullar, the founders of Alcyone Hotel Residences and owners of Citimark Properties, expressed their delight and passion about the opening of the new hotel. “Our development team’s unrelenting pursuit of quality in creating and delivering this new Apartment Residences will shine through in the experience and appreciation by the residents and guests alike,” they said. Alcyone Hotel Residences is located on Hercules Street in close proximity to the bustling Portside Wharf, Doomben and Eagle Farm racecourses, and all of Hamilton’s fashionable dining and shopping offerings.